KLM, the Royal Dutch Airline, has been around since 1919. And for 12 years, it has been ranked Most Sustainable Airline by the Dow Jones Sustainability Index. What this means is that KLM, the world’s oldest airline still operating under its original name, is simultaneously one of the planet's most cutting-edge carriers. KLM's twofold aim for its second century of operation is to be the world’s most innovative and most sustainable airline. The company is actively seeking ways to make air travel greener, and KLM employees in every department are rewarded for green ideas and actions. You can be sure that this airline's sustainability initiatives go way beyond paperless ticketing. It's hard to imagine that air travel, which uses so much fuel, can ever be sustainable. But KLM is making steady progress. Here's how the Dutch airline is on track to approach sustainability in the next decade or two. Green activists consider the carbon emissions from jet engines the aviation industry’s biggest threat to our planet. Carbon dioxide, or CO2, contributes to climate change, severe weather, freshwater shrinkage, air pollution, and other ills. KLM’s Climate Action plan addresses these threats point by point. Airlines measure CO2 emissions by the amount of jet fuel burned to carry each passenger’s weight and baggage. KLM's CO2ZERO program is in place to reduce its jets’ CO2. The airline's Climate Action Plan involves several factors. “Fleet renewal” is one. This means newer, more fuel-efficient jets. The Boeing 787-9 Dreamliner, unveiled in late 2016, uses 40% less fuel than comparably sized jets. KLM flies the Dreamliner in numerous long-haul flights including those between its Amsterdam hub and North America (New York, San Francisco, and Calgary); Dubai. The Dreamliner also flies to and from multiple cities in East Asia. “Operational efficiency” is another way that KLM lessens its CO2 output via more efficient jet maintenance. Routing is a factor, too. KLM flight plans are designed to minimize the time that its jets spend burning fuel on the tarmac, in the air, and circling to land. KLM has developed the green practice of “water washing:” cold-spraying its jet engines in flight. Known to employees as “turn, not burn,” water washing keeps engine temperatures down, which causes them to burn less fuel. Biofuel, a hybrid jet fuel that with fewer ill effects on the atmosphere, is a promising innovation for the aviation industry as a whole. KLM (along with its corporate sibling, Air France) has pioneered the use of greener alternatives to standard jet fuel. The airline has invested in biofuel development and partnered with companies that are focused on this. 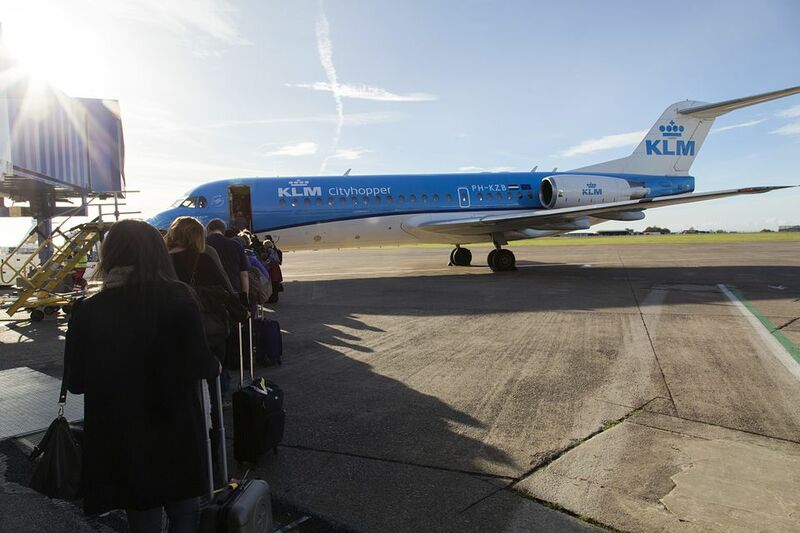 Today KLM operates numerous daily flights powered entirely by biofuel, particularly from LAX in Los Angeles and JFK in New York to the airline’s home airport in Amsterdam. KLM plays a pivotal role in environmental upgrades to its hub airport in Amsterdam, Schiphol (pronounced "Skipple"). To run the airport 24 hours a day, 365 days a year, alternative sources of energy are increasingly used, with major energy contributions from wind turbines and solar panels. Almost all ground and cargo vehicles use "red diesel," which is mixed with biodiesel and is low in harmful sulfurous exhaust. Within Schiphol, airport operations are paperless, both in customer service and in-flight operations. The airport is sunny, welcoming, and friendly. With passenger services like sleep lounges and dog runs, it is an increasingly attractive hub for travelers. As Schiphol expands, measures are being taken to reduce noise inside and outside the airport. Schiphol is the founding member of Airports Going Green, an international organization. KLM has instituted a carbon-offset program that many other airlines have taken inspiration from. “Carbon offset” means simply that passengers donate to conservation programs that make up for the harm they’ve done by flying. In practice, “carbon offsets” are essentially charitable donations, packaged by the airline or by environmental nonprofits. Your offset purchase can help buy a forest to save it from destruction or to replant trees in deforested areas (as KLM has done in a significant way in Panama) or to upgrade energy-hogging machinery in developing countries. Carbon offsets are typically added to your ticket price, but KLM (and some other airlines, like Air France and United) allow passengers to use miles to purchase them. Besides releasing fewer toxins into the atmosphere, we can opt to create less waste. KLM has made waste reduction a pillar of its sustainability initiative and is on track to cut its waste output in half by 2025 compared to 2011. For this airline, waste prevention involves many practices. One is something that many of us observe in our own lives: no more paper media. Newspapers and magazines are no longer distributed in KLM economy class, saving 50,000 pounds of paper annually. Instead, coach passengers can read various current media on the free KLM Media app. KLM throws nothing away that can be reused or repurposed. Whatever objects passengers use inflight, from pillows to silverware, is collected for re-use within KLM. Components of the jet itself-–from the metal body to the cabin carpeting—are recycled or “upcycled” (which means used by someone else). No reuse possibility is overlooked. In 2017, students at the MOAM design school in Amsterdam produced a fashion show whose clothes were made from KLM jet material including carpets, seat belts, cushions, flight attendant uniforms, and even tires. Everything on your KLM meal tray is recyclable, and what you don’t eat is composted. The foodstuffs that KLM’s catering kitchens use are Fair Trade and sustainable, from the fish served to the palm oil used in cooking. Airline passengers can make environmentally savvy choices. Purchase “carbon offsets” from your airline: charitable donations to environmental projects. It's up to all of us to do what we can. Got an American Airlines problem? Get Action! What Are the Top Airlines in Latin America? Do Airline Employees and Their Families Always Fly Free?